Frankie Landau-Banks at age 14: Debate Club. Her father's "Bunny Rabbit." A mildly geeky girl attending a highly competitive boarding school. Frankie Landau-Banks at age 15: A knockout figure. A sharp tongue. A chip on her shoulder. And a gorgeous new senior boyfriend: the supremely goofy, word-obsessed Matthew Livingston. 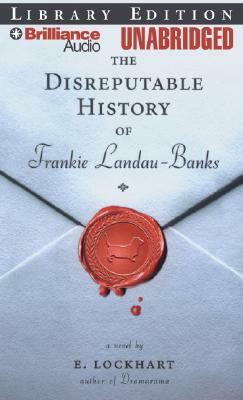 Frankie Laundau-Banks. No longer the kind of girl to take "no" for an answer. Especially when "no" means she's excluded from her boyfriend's all-male secret society. Not when her ex boyfriend shows up in the strangest of places. Not when she knows she's smarter than any of them. When she knows Matthew is lying to her. And when there are so many, many pranks to be done. Frankie Landau-Banks, at age 16: Possibly a criminal mastermind. This is the story of how she got that way. Chosen as a 2009 Michael L. Printz honor book.